Splash Lagoon Water Park is included with park admission (in season). Splash Lagoon is the place to be on a hot summer day, where you can relax in the Lazy River, ride the waves on Surf’s Up Wave Pool, and get splashed by the giant Tiki bucket at Tiki Island. Thrill to our newest, award winning water slide additions: Rip Tide, Tidal Wave, Cyclone Saucers and Polynesian Plunge. 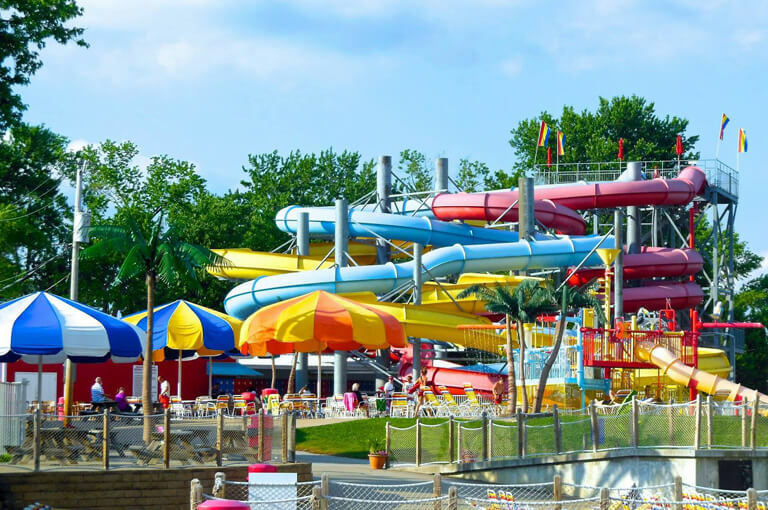 Kids of all ages will love the Ragin’ Rapids water slides – three unique slides offering three different ride experiences. Just want to relax? Cool off in our giant leisure pool or try your hand at the Lilly Pad Challenge. 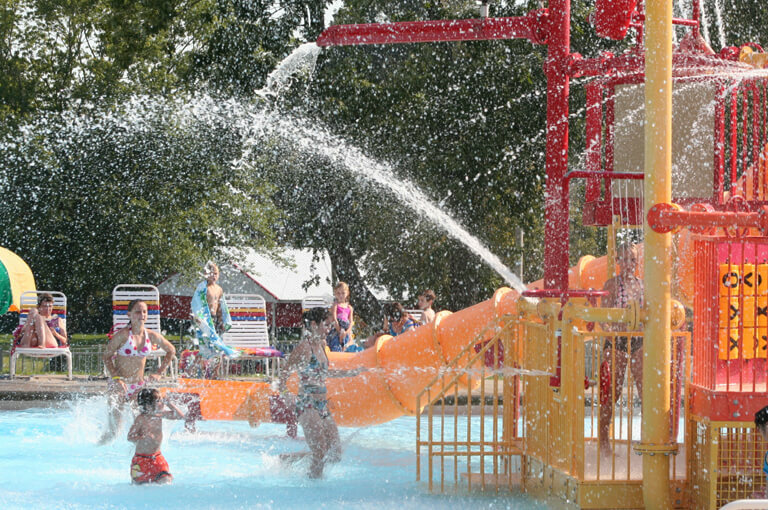 Beech Bend Park’s largest water park expansion in park history is OPEN. The multi-million dollar expansion includes Cyclone Saucers, the FIRST EVER North American installation of ProSlide’s Flying SAUCER ride. This history-making, ground breaking water slide will offer a very unique ride experience. Riders will fly around the edge of three “flying saucers” at high speeds. At nearly 500 feet long with a 55 foot elevation change, Cyclone Saucers is truly a one-of-a-kind experience. Joining Cyclone Saucers are three more new iconic rides. Tidal Wave positions riders face to face as they surge up a thrilling wall and hang weightless before rocketing back down. Riptide features an intense dark ride section, before plummeting into two separate funnels. Polynesian Plunge drops riders from the top of the slide tower into a swirling bowl. Surf’s Up Wave Pool features some of the craziest waves around! 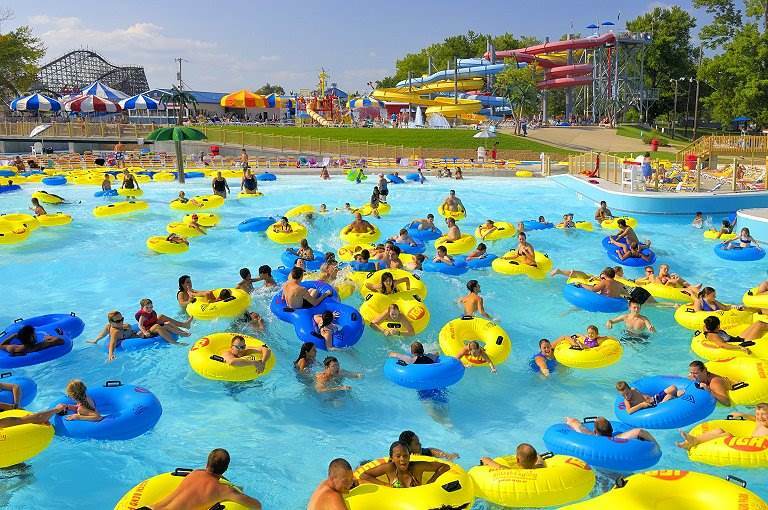 Grab a tube and jump in, and experience one of our most popular summertime attractions. Operating Hours Vary — see Park Hours and Dates. 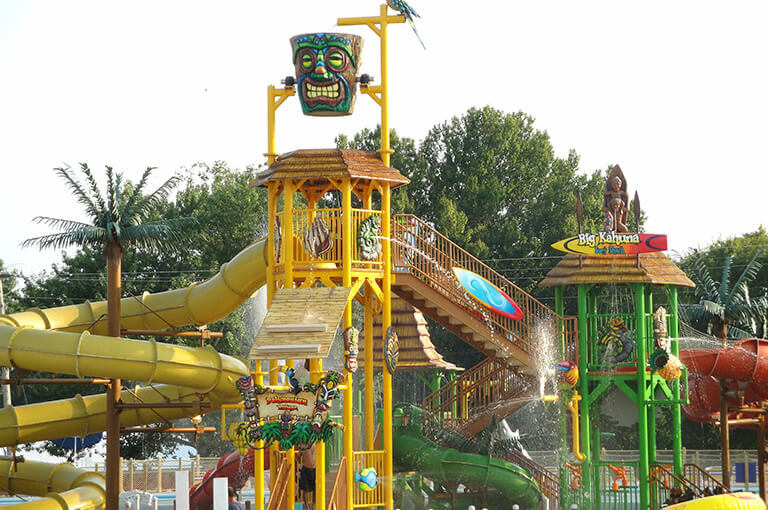 Tiki Island is a four story, interactive, water squirtin’, splish splashin’, water sliding tower of fun. It features seven slides and a giant tipping bucket with a tropical tiki theme. 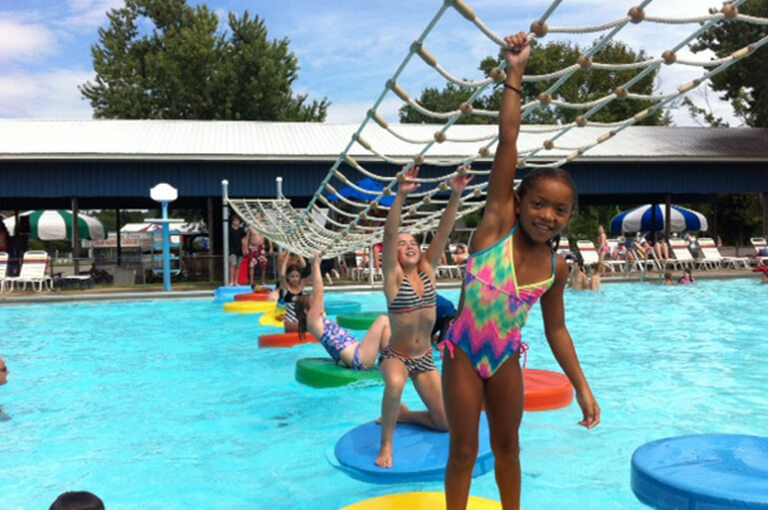 This children’s interactive splash pool features a four level interactive play structure and two slides. This is our original children’s play structure, and it still exists as a family favorite! Come on, get splashed! Do you dare take on the Ragin’ Rapids? 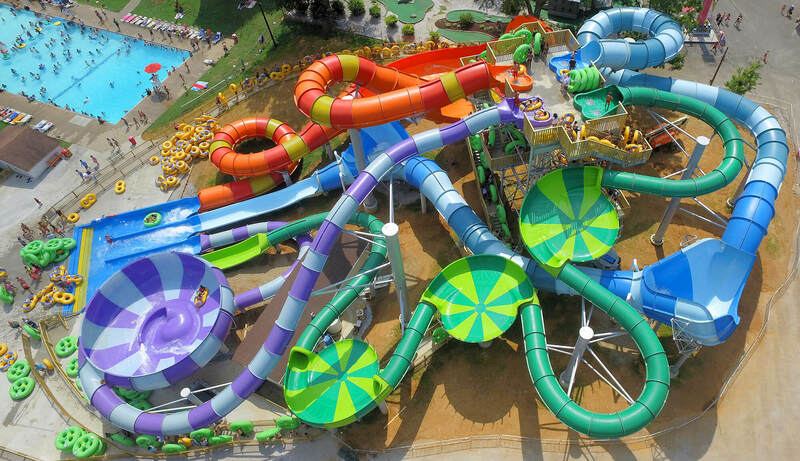 The Ragin’ Rapids water slides consist of one open family slide, one partially open/partially enclosed slide, and one completely enclosed body slide. All three slides boast a length of greater than 400 feet and start from a 45 foot tower. Just jump on in and relax in our oversized giant leisure pool, the largest pool in the southeast. Go swimming in the 10 foot deep end, or float in the shallow side! Think you can cross the Lily Pad Challenge? The Lily Pads cross all 50 feet of the pool. Kids will love trying to conquer the course without getting wet!